Okay, this weather is really wierd. I’ve heard several people make comments along the lines of “where is that global warming we’ve been promised?” Snow on the west coast in April might seem funny (especially to everyone in the east who normally have to endure long winters and the bragging of west coast relatives enjoying early spring), but global Climate Change is no laughing matter. Flooding, drought, loss of some species and the spread of others like malaria carrying mosquitos…..
I’ve always thought a story can have more of impact than a bunch of statistics or dry facts, so in honour of Earth Day, I’ve posted a list of some of my favourite eco novels on the Chapters/Indigo website. Click here for the list. One book, which didn’t make it on the list, because it doesn’t seem to be in print anymore (or at least isn’t available from Chapters/Indigo) is Secret in the Stalakum Wild by Christie Harris. I loved this novel when I read it as a kid in the 1970s. It was the first novel I’d read that drew on West Coast First Nations’ mythology and suggested the forest I loved was in need of protection (plus it was a riveting fantasy adventure — I thought it was a bit dated and didactic when I read it over again as an adult, but it still deserves a place on my personal list of influencial novels). Are there any novels you’d like to see added to the list? 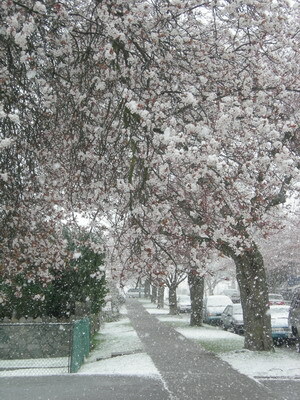 Now the weather has switched to summer mode, and Vancouverites have stripped down to shorts and t-shirts! And I spoke too soon about being finished moving. 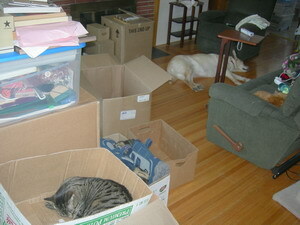 Believe it or not (I hardly do), we’re moving again! 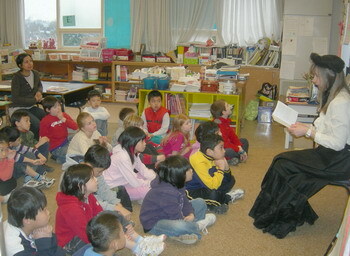 Here I am doing a reading at a school in East Vancouver last week (wearing my 19th century costume to go with my novel Discovering Emily). 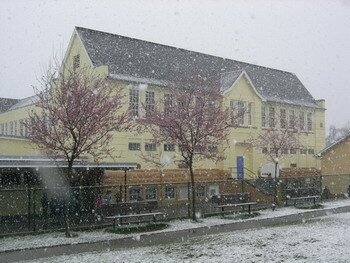 Half way through the reading we had to break so the kids could rush to the window and look out at the snow (and blossoms).